A region of southern Italy is currently calling for sustainable ideas on how to renovate or reuse a stretch of the Salerno-Reggio Calabria highway, located between Sicily and Bagnara, with a focus on implementing a renewable energy into the infrastructure. The old highway will be decommissioned and a new highway is set to be built nearby. Currently the jury is still in deliberation and a winner has yet to be decided for the Solar Park South, but being the sleuths that we are, we came across this fascinating proposal for a parasitic city set to take root on the foundations of the highway's bridges. Although the proposal by Ja Studio Inc called 'Slow Uprising' doesn't actually meet the requirements of the competition, we still love the idea of buildings sprouting on a bridge. Ja Studio Inc viewed the original highway as a colossal project that distanced the population from nature. But now that the old project is being decommissioned, it provides an opportunity to reengage the surrounding towns with the valleys and other terrain of the area. 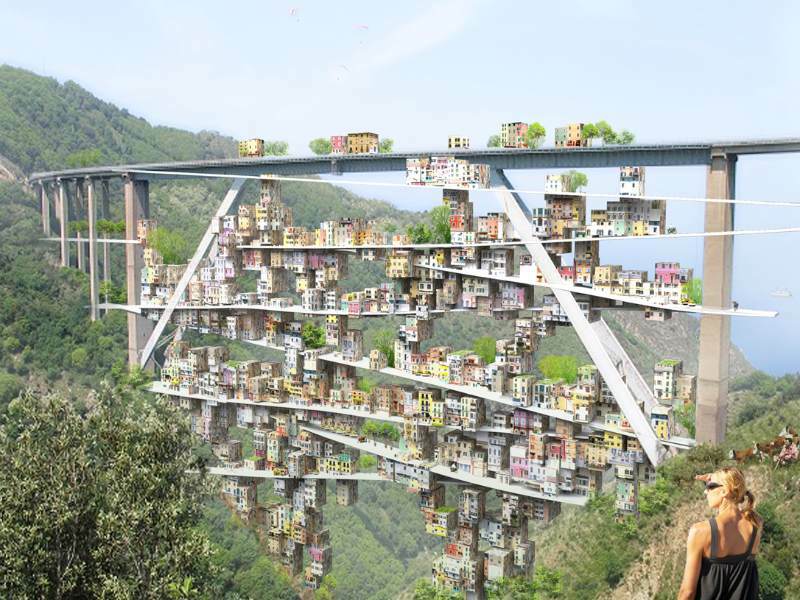 Their proposal calls for a gentle ramping platform that connects the top of the bridge to the bottom of the valley floor, with houses and shops built on the bridge to create a new city grounded in the foundation of the old project. Ja Studio Inc’s Slow Uprising doesn’t meet the rules of the Solar Park South competition, as nothing about their project calls for the use of renewable energy, but given the resuse of a massive piece of infrastructure in their project, they wanted to send in their idea anyway. As Ja Studio partner Behnaz Assadi said, “Our response was not along the requirements of the competition brief, however we sent it for jury review and publication, since we thought it would give a different perspective on the story of the decommissioned highway.” Slow Uprising is also an exploration of a slower paced life, contrasting the fast, frenetic projection the new highway would eventually give way to. If they line the road with solar panels and a way to collect water it could work really well! Where do you put the plumbing? William Gibson, the person who coined the phrase cyberspace, thought of it years ago. Hang solar panels and/or wind turbines from the bridge and build terraced living spaces on the hillsides powered from the bridge \"system\". The use of bridges for habitation is an interesting idea intending to reduce the eco footprint of future cities, I first saw it being presented by Terpsichore Latsi at an experimental studio at TU Delft in 2009. I understand the people questioning construction issues but at the current stage, while this is still an idea that rather depicts intentions than a complete solution, criticism of this level is rather out of subject. This may be the worst early April Fool's joke I have ever seen, for so many reasons, it is unbelievable. This is the most stupid project I've ever seen, after the CD/DVD rewinder machine. Are you kidding me? So useless, unsafe and unpractical. Human stupidity reached new heights. Uhhh... knock it down and recycle the steel and concrete??? 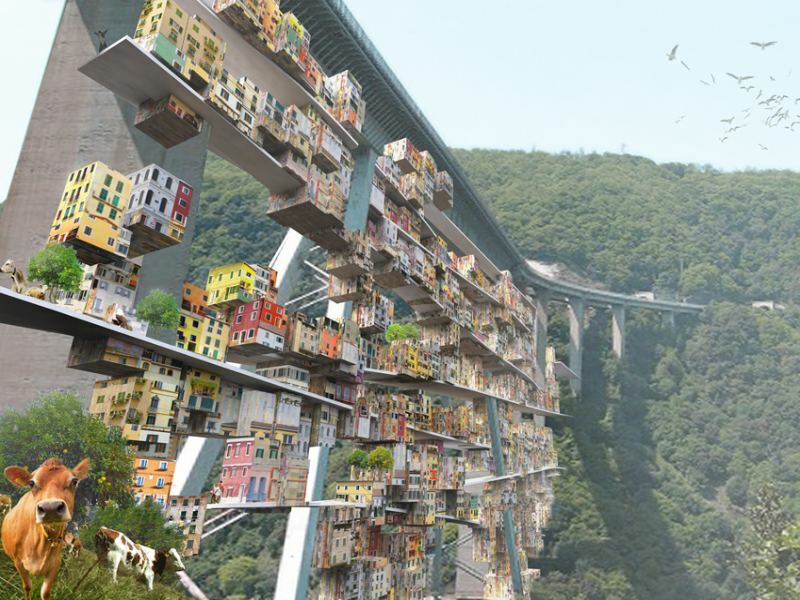 Ja Studio Inc proposed a very unique way to reuse the decommissioned highway that involved building a sloping ramp to the valley floor and constructing a new city on the foundations of the old bridge. Solar Park South is a design competition led by Regione Calabria - Town Planning and Territorial Governance Department. Given that an old highway is being decommissioned in favor of a newer faster highway, the region wants creative ideas that could reuse the old highway. The old highway crosses over deep valleys and winds along the southern Italian coastline. The new highway will be much faster and require less massive infrastructure like this bridge. The region wants not only to reuse the highway in a sustainable manner, but they also want to incorporate solar and other renewable energy systems as part of the reuse or renovation of the infrastructure. Ja Studio Inc's proposal, 'Slow Uprising', suggests reusing the infrastructure of the old bridge to create a new parasitic city - one that grows organically over time and reconnects people with the varying terrain. Slow Uprising also proposes a slower paced life, one that is skeptical about clean, fast, advanced engineering solutions and takes root on the spot of the former "classic" bridge.